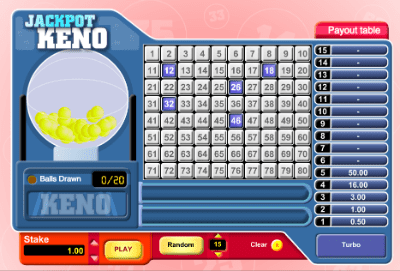 Keno is a lottery-like game which is popular in many pubs, clubs and casinos in Australia. It is also available to play for free and real money online. This article will teach you how to practice or play free keno at real money gambling websites. This allows you to hone your betting patterns or game strategies and make sure you know what you are doing before depositing any money. What is practice play or free play keno? Free play keno is an excellent way to immerse yourself in the world of Keno, without having to wager real-money. Online practice play is perfect for those players who want to get accustomed to the game before loosening their purse strings, or for those who don’t feel comfortable using their hard earned coin to engage in online gambling. You can play keno for free for as long as you like – there is no set time limit to how long you play for – giving you the opportunity to extensively test each and every game before progressing to real money play. Once again – to make our point resolute – the keno games recommended through this site can be played completely free, no membership or account fees, no deposit required to play the game, with the only downside being there is no money to cash out if you win. Free play is even available at online casinos sites that no longer accept Australian players, so you can play casually without gambling real money and without having to sign up for an account. Do I have to download anything to my computer or mobile? No. Keno games played for free or real-money through any of our recommended online casinos are able to be played on your computer, mobile phone or tablet directly through your internet browser. While some casinos do have their own apps, it is completely up to you how you want to play Keno, with web browsers offering the same high-speed, instant play you would get through an app without the drama of downloading a program onto your PC or mobile. An example of the many keno games you can play in practice mode. You can play this game at Emu Casino. Look at the table for above for $3 free. Jackpot Keno: This game can be played for fun and for real cash and requires players to pick up to 15 numbers. There is also an auto pick feature which will randomly choose numbers for you. If you pick 15 numbers, you will need three matches to receive the minimum payout (in play money or real money). It is definitely a game for the players searching for a traditional format, including animations of a lottery-ball machine. Keno Deluxe: Featuring high-quality 3D graphics, Keno Deluxe is very polished and provides players with an enjoyable experience. It is unique compared to some other Keno games in that it does not instantly reveal all numbers which have been drawn, with individual numbers instead falling down a chute one-by-one, much like they would using a lottery machine. Monkey Keno: This game is more relaxed and light hearted, featuring bright, colourful graphics and vibrant audio features. Once again, players choose up to 15 numbers, with an animated monkey shaking a tree which drops coconuts onto the board, selecting the numbers they fall on. We like this game because it retains all the structure and rules of keno, with an enjoyable and entertaining element. All of the aforementioned games, plus a wide variety more, can be played for practice or for real money at some of the best online casinos on the web. The top-rated sites are all quipped with the highest standards of encryption software to protect all of your personal and banking details, whilst they are also regulated under rigorous licensing terms. Additionally, all of our recommended casinos give players a generous welcome bonus upon sign-up, so if you do decide to progress to money play you can double your kitty prior to placing your first wager. How good is that? Keno is played using a ‘Keno card’ which is a grid featuring numbers one through to 80. Players must select between one and usually 10 numbers (some games allow you to select up to 20 number) on the card and if all of their numbers are called out (much the same as Bingo) then the player wins. Players can change their numbers for each game or can keep the same numbers for a prolonged period. Players can also select how much they would like to wager, normally between $1 and $20 per game, with the amount of numbers they have selected also impacting the final payout if all of their numbers are picked.